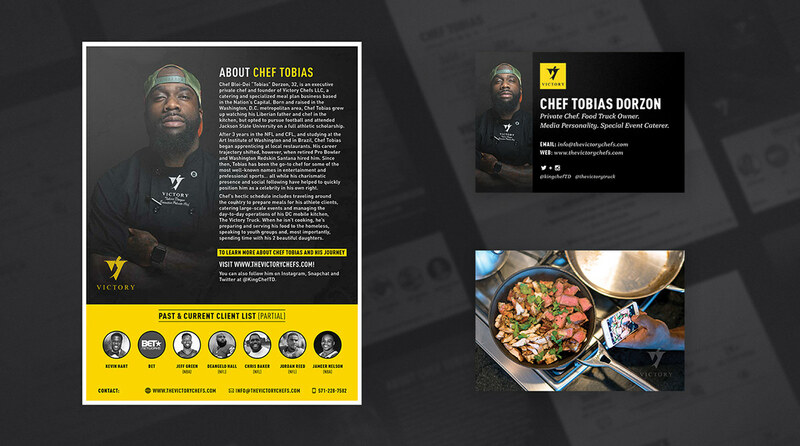 Chef Tobias Dorzon is a well-known personal chef to big name celebrity clients such as Kevin Hart (Stand-up Comedian) and Jordan Reed (NFL), just to name a few. He is now pivoting his culinary prowess and bringing his game to the local DC Food Truck scene. And what better way to bring attention to Chef's talent? Simple. Hold a Tasting event where you can try the food on the upcoming Victory Truck menu. 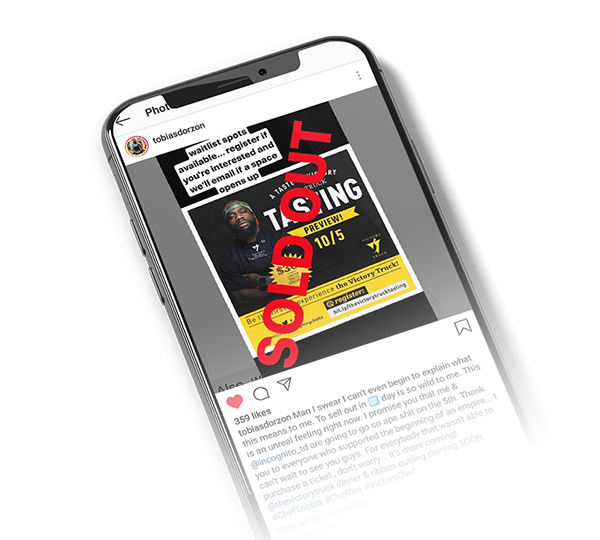 - We created a flyer to post on Instagram to promote the event. - Set-up a Media Kit for business inquiries. - Designed Business Cards to keep the world in touch with Chef and his team. We created a bold and simple brand system that worked across the different digital and print media. Using photography as our main focus, Chef Tobias is front and center. Connecting the viewer with the man behind the menu. Introducing the Chef to celebrities — as a celebrity in his own right. And the Best News — the tasting Sold Out on September 21! Giving Chef and the Victory team plenty of time to prep the October 5th menu. A great way to launch the Victory Food Truck and the build their local DC following. The next time you're in the Washington, DC area, be sure to dine with Victory! Branding for local DC Food Truck, the Victory Truck!